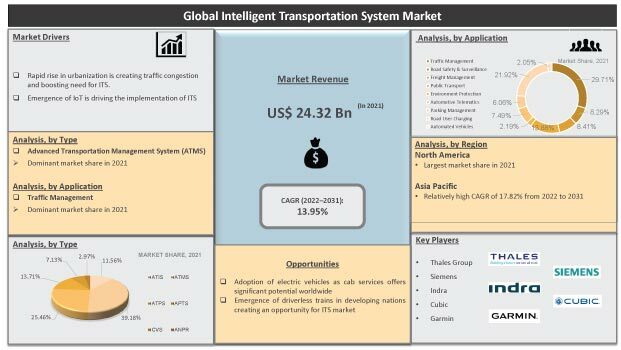 The global intelligent transportation system (ITS) market features a fragmented landscape with the presence of a multitude of global and local players, notes a recent market study by Transparency Market Research. While there is no clear leader, some top companies in the market are Siemens AG, TomTom N.V., Hitachi, and Garmin International. “Mergers and acquisitions is the focus of top companies in the market for business growth, says the author of the study.” A case in point is Siemens AG. The company acquired Rockwell’s Integrated Local Government (ILG) unit; the unit provides real-time information management systems and solutions for improved safety of public transit and transport. Initiatives for robust research and development is also the growth strategy that top companies in the global ITS market are engaged in. An excellent example is Hitachi. The company has invested more than US$ 750 million for research in automotive, social infrastructure, and industrial systems segments. The global intelligent transportation systems market was valued at US$20.22 bn in 2015 and is expected to be worth US$57.44 bn by the end of 2024 rising at a CAGR of 12.7% between 2016 and 2024. In terms of type, advanced transportation management systems held the largest share of 41.0% in the global market in 2015. This is mainly due to the increasing adoption of advanced traffic management and control solutions for the watchdog of traffic flow in urban and sub-urban areas. On the other hand, public transportation systems is expected to display robust growth at a CAGR of 12.9% between 2016 and 2024. By application, traffic management stood as the leading segment in 2015 and is expected to retain its position until the end of the forecast period in 2024. However, automotive telematics is expected to display significant growth in the after-market as an increasing number of vehicle owners are installing these systems for enhanced vehicular safety on the roads. In terms of geography, North America held the largest share of 41.2% in the overall market in 2015. Although the region is expected to display a declined market share until the end of the forecast period, it is expected to hold its dominant position, says a TMR analyst. Strong road networks and efficient transportation system are vital for any country’s social and economic development. However, traffic jam is a major issue in urban and sub-urban areas that not only leads to higher fuel consumption and increased travel time, but also indirectly impacts economic growth. The adoption of intelligent transportation systems has emerged as a formidable solution to combat these issues, which is the foremost factor driving the global ITS market. In developed regions of the world, advanced traffic management systems are a regular feature to maintain traffic flow and avoid congestions. As per several ITS associations across the world, ITS reduce waiting times at traffic signals by 20%-30% and travel time by as much as 25%. This is favoring the growth of the overall ITS market. The increasing need to improve road safety is also favoring the adoption of ITS. Across the world, road accidents are a major cause of death and account for more than 2% deaths. In absolute numbers, these accidents cost approximately US$520 bn each year worldwide. On the flip side, economic slump in several countries and interoperability insufficiencies between ITS and existing infrastructure is limiting the adoption of these systems.